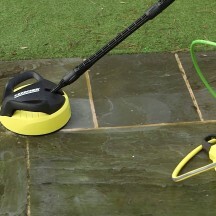 You must be very careful if you intend to use a pressure washer on external natural or artificial stone patios and paths etc. This article is intended as a guide, not to be a comprehensive set of instructions. We would like you to avoid some of the common and often disastrous errors. Completely avoid the use of a lance (which provides a narrow jet of water) on most stones. A lance will often damage the surface of a stone by scribing lines into it. This damage is usually irreparable. You can use the "rotating" type heads that are available for most good machines. They can be small, inexpensive domestic units or much larger, expensive, commercial machines. If the surface is dry it is a good idea to thoroughly soak it first and keep it wet, for about half an hour before you start. Use the machine as per the manufacturer's instructions. You will not be able to remove Black Spot Lichen or Severe Algae. For this you should look at our article on Algae and Black Spot Lichen by clicking here. You will find Algerase and Biorase useful products. If you have oil or grease stains from food or a BBQ you should use Powerase because pressure washing is more likely to do damage than good. If you have "coloured" food stains such as Tea or Wine use Biorase as pressure washing is highly unlikely to work and may damage your stone in the attempt. For Rust Marks please refer to our article by clicking here.